Beginning readers may not know about stereotypes. They just know that Woof and Quack like to play fetch. Using fewer than 50 words and their variants, Swenson challenges species-specific behavior assumptions in this engaging, somewhat silly, and mildly surprising early reader. When Quack (a male mallard) learns that Woof (an un-gendered brown dog) does not like to fetch balls and other thrown objects, his only comment is “That is interesting”—since he loves fetching. It doesn’t take long before Woof is throwing and Quack is fetching increasingly unconventional items. Similarly, in companion title Woof & Quack in Winter, Woof assumes that Quack will want to fly south for the winter. Instead Quack delights in all the snow activities while Woof is the one who longs for warmer climes. 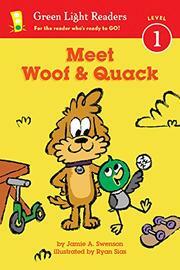 In both books Woof's and Quack’s playful delight is helped by the use of common ideophonic sound effects. “NOM NOM NOM NOM NOM NOM NOM” sounds just like a duck and dog eating cake. The text is conveyed primarily through dialogue in speech bubbles that make it clear who is speaking and help new readers read expressively. The format allows for plenty of repetition as the duck and dog often confirm what the other said. Exuberant and expressive cartoon illustrations set against bright solid color backgrounds express the genuine friendship of these unlikely pals.